lt;stronggt;RCPH226lt;/stronggt;lt;BR/gt;Rubbermaid-Gripper Wet Mop Handlelt;BR/gt;Plastic jaws firmly grip mop head. Allows quick mop changes. Ideal for 5amp;quot; wide headband mops. Handle Length: 60amp;quot;.lt;BR/gt;lt;BR/gt;lt;stronggt;RCP617388BKlt;/stronggt;lt;BR/gt;Rubbermaid-Gripper Wet Mop Handlelt;BR/gt;25-gallon vinyl bag attaches to handle. Three shelves for supplies hooks for mops and brooms. 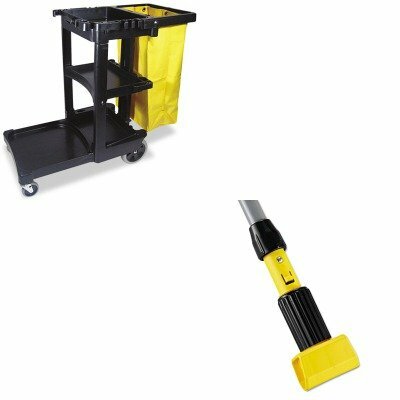 Platform holds standard size bucket supplies not incl.. Color: Black Caster/Glide/Wheel: Four Casters.